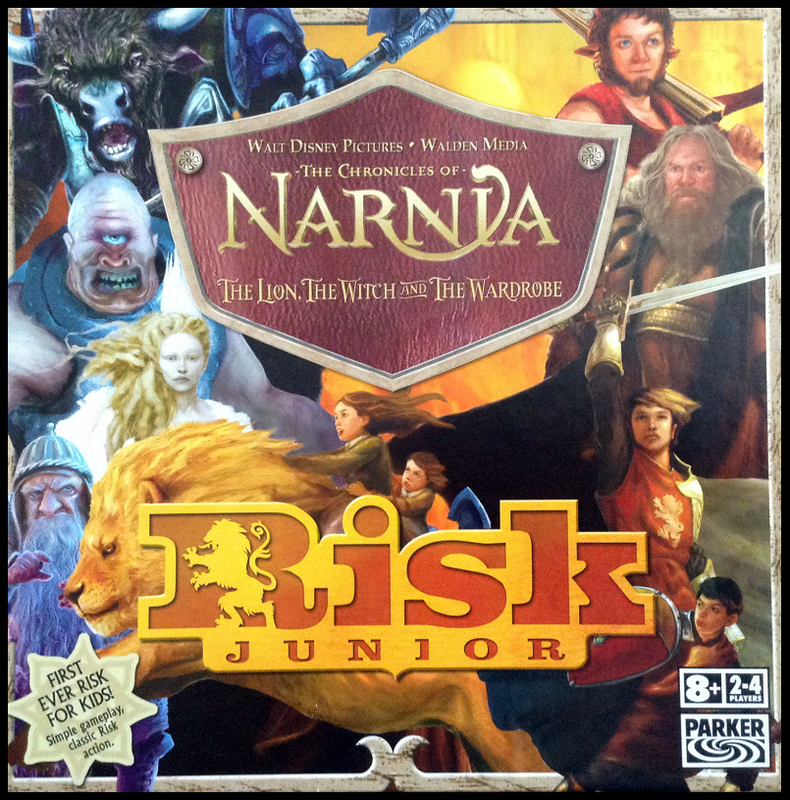 Risk Junior: Narnia is a variation of the standard Risk game, released in 2006 by Parker Brothers (Hasbro), designed by Richard Borg. It supposed to be a stepping stone between board games targeted to kids and board games targeted to adults. 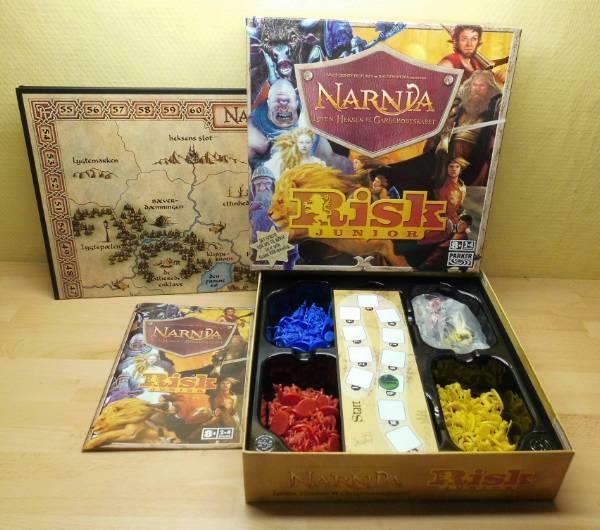 In most cases, not much thought is given to introducing children to more mature board games that usually require a deeper understanding of game mechanics and strategy and this is where Narnia Risk Junior comes in. Risk Junior: Narnia didn’t see a big release in the United States but it was well received in Europe and the UK, so if you’re ever in those parts trawling for some board games to buy, you might very well see this little interesting game on the shelves. 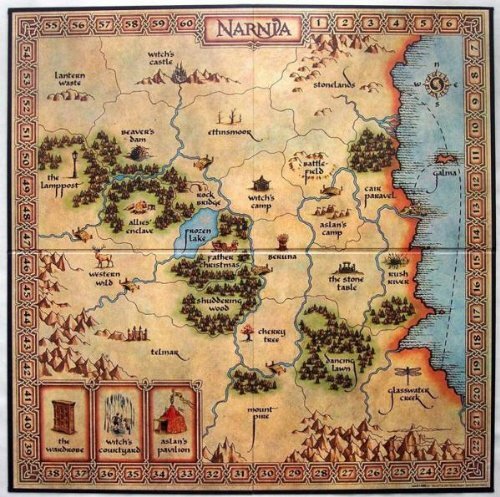 Counter-intuitively, Risk Junior: Narnia actually has more complex rules than playing the standard Risk game we’re accustomed to and ostensibly, they take out most of the strategy involved. Dice rolling no longer relies on the number of troops, with each defender and attacker rolling either 2 or 3 dice, regardless of the number of troops. The person who has the highest roll no longer matters, it only matters if you roll a 5 or 6. Your initial attack on your turn is decided by drawing a card, although you can still choose where to go with that army after that initial attack. The list goes on. Aside from those changes to Risk’s strategy, Risk Junior: Narnia also introduces a good vs evil interplay, where the forces of Evil (The White Witch) fight against the forces of good (Aslan). This means that free-for-alls and ad-hoc alliances of the classic and online Risk games are gone, replaced by a known enemy and a known objective. In addition to that, the game map is considerably small, probably the smallest of all the variants, which means that play is very fluid and dynamic, with critical spots changing hands all the time. Yet don’t let all that scare you off from Risk Junior: Narnia. It’s still a fun little game, especially if you’re playing with kids, and it’s always fun to explore new variations on the classic Risk and the online Risk game. As mentioned above, since there are two sides, good and evil, players are split up with 1 player as The White Witch and the rest of the players as Aslan’s Forces. While there really isn’t that much of a difference between the soldier pieces, the main differentiator between the two sides is in their special abilities, mainly that The White Witch can turn soldiers into stone, and Aslan’s forces can cure or revive depending on the roll. On a typical turn, the player first draws an event card. These cards usually have a variety of effects, none of which are powerful enough to alter the game’s outcome, but can gently nudge the game in a certain direction. Nestled in this deck are three special scoring cards: “Always Winter & Never Christmas”, “Father Christmas” and “The Lion, The Witch and The Wardrobe”. If one of these cards are drawn, the game pauses, and ‘Crown Points’ are awarded for how many camps are owned, and which side has the most territories at that point. If the player draws “The Lion, The Witch and The Wardrobe” then the game ends after scoring, otherwise play continues. 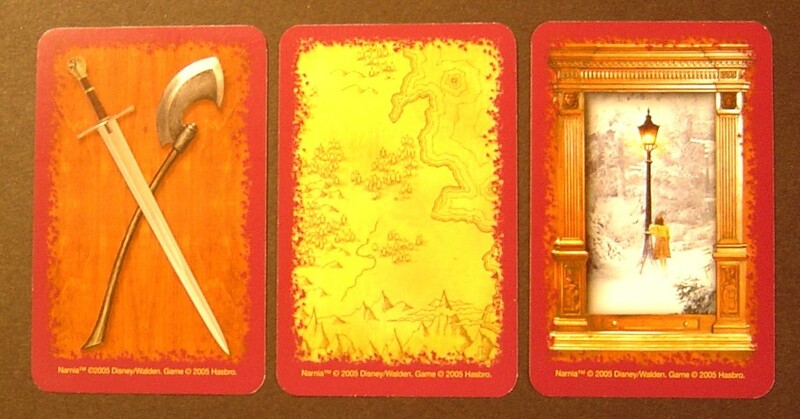 After the event card, a player will then draw a territory card which delineates where a player’s army goes next. If a friendly army resides there, then the player can choose to attack one of the adjacent territories. On the other hand, if an enemy resides on that territory, then the player must attack it. Thankfully, the battle step is preceded by an army placement step, where players can bolster their troops from their reserve. Since this comes before the battle stage, it pretty much decides for you where the bulk of that army is going to go. While it might seem a bit cheesy, it balances well in making up for the fact that you don’t get to freely choose where you attack next. Once the troops have been placed, then the attack takes place. Battle in the game is pretty straightforward: The defender rolls 2 dice, and the attacker rolls 3 dice, or 2 dice if they’ve used a river bridge to make the attack. Unlike traditional risk, where the dice are rolled against each other with the higher one winning, Risk Junior: Narnia depends on mostly two numbers to decide the troop fights: 5 and 6. If a player rolls a 5 then they take out an enemy’s weak minion, while a roll of 6 takes out either a strong minion or a week minion. Aside from the normal troops, players can also bring a pool of characters that live in the world of Narnia, with each character having a special ability that kicks in if a certain number gets rolled. For example, The White Witch can use a roll of 2 to freeze an enemy minion, whereas Lucy can revive frozen minions on a roll of either 4, 5 or 6. Finally, these characters can be taken out and returned to the pool on a double. To win the game, players either have to wipe out the opposing faction, which is incredibly unlikely in Risk Junior: Narnia or have more points once the “The Lion, The Witch and The Wardrobe” card is drawn. Given the way that the event deck is shuffled, the chances of getting that game ending card are high, so this game is almost always a hands-down battle for points. 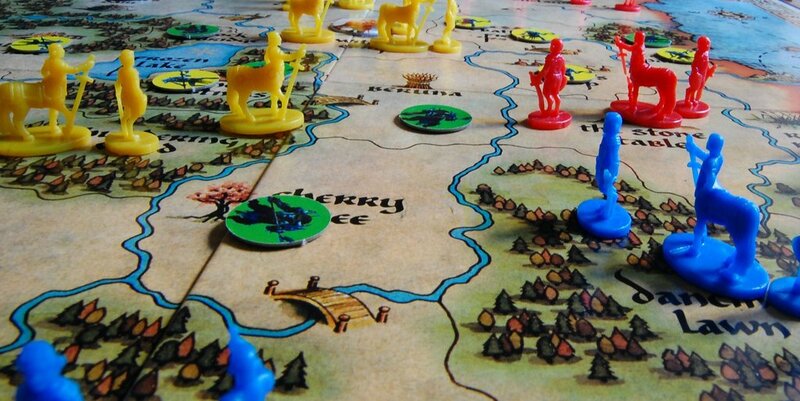 While Risk Junior: Narnia will be a little bit hard to get used to for seasoned Risk players, or even for gamers who play Risk online, it’s a pretty good entry for kids, using the world that they know and are familiar with to introduce them to the world of complex Risk board games. The rules might be slightly complicated, which is why an adult player should be around when the game is played, but they tend to make the actual gameplay much simpler and smoother. Combined with the small shape of the map, the play time is considerably short compared to standard Risk, which means you don’t have to worry that much about younger players getting restless from long hours or losing interest and focus. All in all, if you want to introduce young players into the wider world of Risk board games, Risk Junior: Narnia is a great, sweet, and fun way to do it.